A place to share my creative ramblings! May you find inspiration everywhere! This is going to be a really quick post. My boys are home this week (Spring Break - Yay!) and we are headed out to play! It just goes to show that a quick card can be a very elegant card. This used the Floral background stamp, card stock, a length of coordinating ribbon and a couple of punches. Done! Enjoy your day! I'm going to! Thanks for looking and I'll have another card for you tomorrow. Supplies (all SU! ): Floral background stamp, Regal Rose ink and ribbon, Whisper White & Regal Rose card stock, Paper piercing tool & mat pack, Scallop oval and Large oval punches. 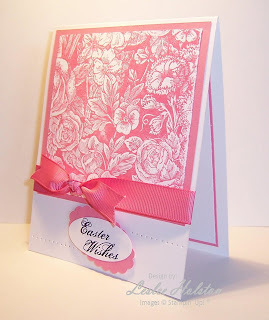 I love stamping, paper crafting and sharing it with others! My husband of twenty years tolerates my habit. My boys (my pride and joy) think everything I do looks great! Of course, they all know who feeds them! I've been a demonstrator with Stampin' Up! for twelve fabulous years! I hope to inspire you creatively!! As always, thanks for stopping by! Content found on my blog is my sole responsibility as an independent Stampin' Up! demonstrator and the use of and content of the classes, services, or products offered on Leslee’s Creative Inspiration is not endorsed by Stampin' Up! The purpose of this blog is to share creative inspiration. I love to share but, please, do not copy for publication or contest entry.